You look wonderful Lilli, I love the hat! Lilli that hat is stunning. I love all the tones of blue mixed with some tan. I want that hat. NOW! Bellissima la gonna, sei sempre perfetta Lilli! Un bacione. I really love that skirt Lilli and you have reminded me I urgently need a new pair of gladiator sandals, mine are falling apart! Blue is my favourite colour.mim loving your polka dot skirt. It's so fun to wear. Your white sandals is just fabulous! Enjoy Lilli! Loving your skirt my doll! Bello, bello, bellissimo questo look... lo avevo già ammirato su FB!!!!! Mi piacciono da impazzire i sandali!!! Molto bella la gonna, un look pefetto! This is such a pretty summer look Lilli! I'm totally in love with your skirt from the tiering to the polka dots and the winglike detail on your sandals is so cute! 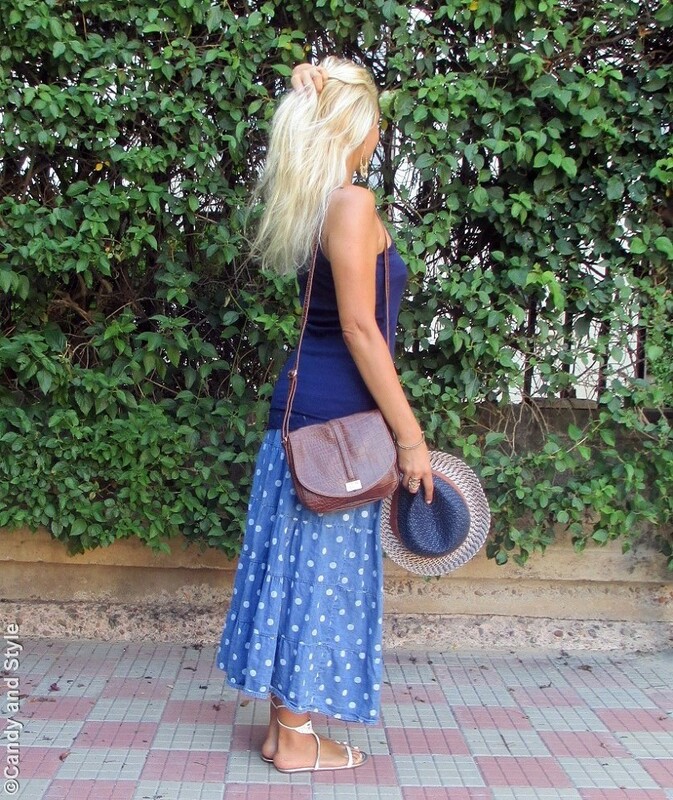 Your skirt looks like denim, with dots and lace looks so chic, Lilli! You look so nice in blue! Your shoes are so cute and I like the earrings! The Summer is almost over and I haven't bought a hat yet! I love your style!!! nice accessories!!! Dear Lilli, a perfect summer Look. And everything matches perfect, even the nail polish at your feet with the sandals. :) I love all the accessories, especially the ring and the cute necklace. But the coolest accessories is your fedora. Is your Mango bag new? Very nice! 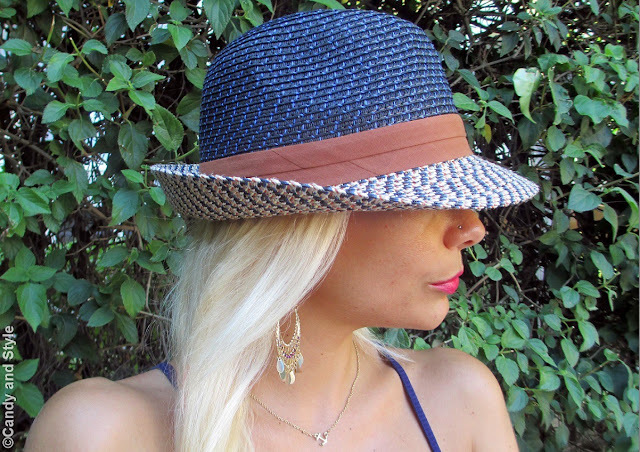 What a lovely, casual summery look, Lilli and the straw hat is such a gorgeous touch to the whole outfit! I do love anything blue, it's actually one of my favourite colour! Lilly sei veramente bella e trovo il blu ti doni molto. Lilli quanto mi piaci con questo outfit. Ti dona moltissimo. Bellissima la gonna e il cappello. Great summer look Lilli and those sandals are so cute. Cute sandals! I'm in love with the skirt. I love this outfit Lilli! Love the edging of your tank at the hem. The skirt is gorgeous and so are those sandals :D Gorgeous earrings! You look so pretty! Very pretty and romantic, Lilli. Love this look with the maxi skirt. And that bag is so fabulous. adorabile questa maxi skirt! e anche i sandali mi piacciono tanto! Your sandals are too cute, Lilli. I love the outfit. Summer still rules :) very nice look for holidays. 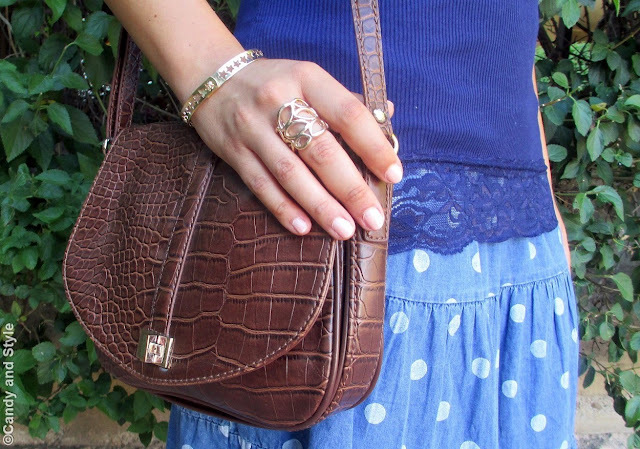 Like the blue theme and the shoulder bag looks very practical (good size)! What a beautiful mix of blues and the textures are lovely! 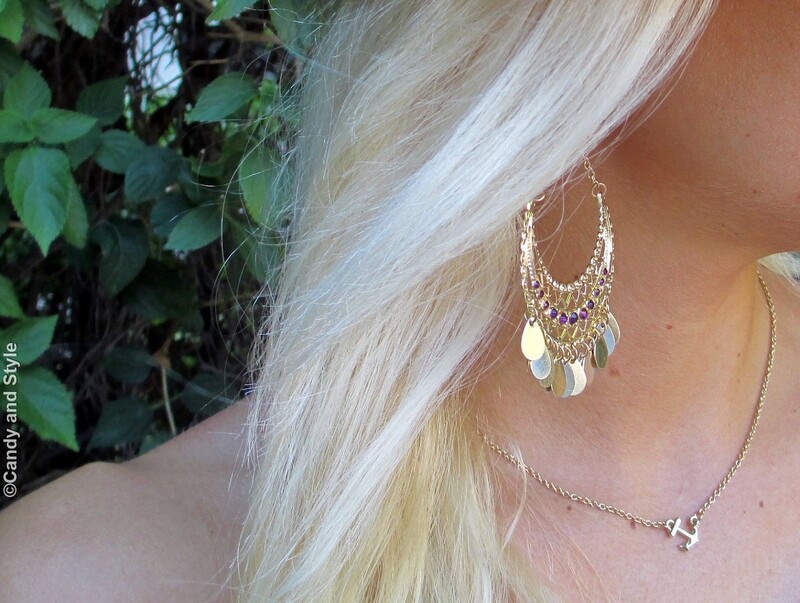 Your accessories are so sweet and perfect for summer too! Stunning as always Lilli! Hi Lilli! A fresh and comfy look, polka dots skirt is my favorite like the gladiator sandals with the butterfly detail too, I need a similar hat so I put on my wish list for next summer! Kisses.